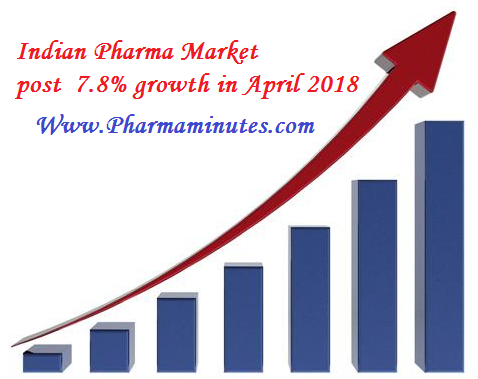 Indian Pharmaceutical Market (IPM) has registered a growth of 7.8 per cent during the month of April 2018 and reached at Rs.10,402 crore. However, this growth is slower than the growth of 9.3 per cent registered in March 2018. Though the volumes have posted a positive growth, the price component is dragging the market. As per the AIOCD AWACS report during the quarter ended April 2018, volume growth was at 6.8 per cent, but price growth was at negative 1.1 per cent. New products fared comparatively better at 2.5 per cent. Fixed dose combination (FDC) related market showed growth of 14.8 per cent while the non FDC market showed a growth of 7.9 per cent. Single molecules grew at 7.5 per cent. Price component of GD for the FDCs for April 18 is 0.6 per cent, other GDs in terms of volumes are at 13.6 per cent while new products are growing at 0.6 per cent. The single molecules are driven by volumes at 6.4 per cent, however the prices are pulling down at negative 1.4 per cent. MNC are growing faster at 9.1 per cent at Rs.2,145 crore as compared to Indian companies growth of 7.5 per cent to Rs.8,256 crore..
Lupin has registered highest growth of 15.7 per cent among top 10 corporates followed by Abbott at 13.8 per cent and Alkem at 13.2 per cent. Amongst the top 50 corporates, 43 corporate registered positive growth of IPM during April 2018. AstraZeneca has the highest growth of 29.2 per cent among top 50 corporates followed by Win Medicare growing at 21.6 per cent and Hetero at 19.1 per cent. Sun Pharma portfolio has shown a growth of 7.2 per cent, Ranbaxy has slowed down at 2.1 per cent. There were 17 new companies during the last 36 months, of which only one company registered revenue of Rs.10 crore. Amongst the top 60 MNCs, AstraZeneca was the fastest growing at 29.2 per cent followed by Boehringer Ingelheim growing at 24 per cent and Danone which grew at 22.4 per cent during April 2018. The NLEM 2013 containing molecules market showed growth at 5 per cent whereas the non NLEM market grew at 8.2 per cent. Resulting in an overall growth of 7.8 per cent in April 2018. From therapy perspective, 19 therapies are showing a positive growth. Respiratory market posted a double growth of 16.1 per cent, gastrointestinal showed an improved growth of 9.1 per cent and pain and analgesic market showed a growth of 5.2 per cent. Anti-diabetic market has posted a double digit growth of 10.3 per cent and cardia is almost at double digit at 9.7 per cent, neuro/CNS showed a growth of 7.1 per cent. Anti infectives posted a positive growth of 5.3 per cent and VMS market achieved growth of 7 per cent. Derma is growing at 6.8 per cent. Total 28 regions have posted positive growth during April 2018. North AP market grew the highest at 17.49 per cent followed by Bihar growing at 16.67 per cent and Madhya Pradesh at 16.24 per cent. Amoxycillin plus clavulanic acid market has shown a recovery of 9.3 per cent at Rs.142.8 crore and glimepiride plus metformin market achieved stagnant growth of 0.9 per cent at Rs.177.6 crore. Azilsartan plan market reached at Rs.65.9 crore on MAT basis. Sofosbuvir and its combination market has reached Rs.607.8 crore on MAT basis. The luliconazole market reached at Rs.284.8 crore, while tenegliptin and its combinations have crossed 664 crore mark on MAT basis. The market of paracetamol plain is growing double digit rate at 13.2 per cent on monthly basis, plan atorvastatin has posted a growth of 1.3 per cent and probiotic microbes moved up by 12.4 per cent. Among the leading brands, Mixtard has posted monthly sales of Rs.44 crore while Spasmoproxivon plus has registered sales of Rs.39 crore. Glycomet GP is at Rs.37 crore, Lantus is at Rs.35 crore and Galvus Met at Rs.36 crore and Liv 52 at Rs.26 crore. The performance of new molecule launched dominated by Azilsartan and combinations with value of Rs.68 crore. On MAT basis Zilarbi (Emcure) leading followed by Aztric (Intas) and Abel (Lupin). Luliconazole segment is worth Rs.285 crore on MAT basis and there are already 54 brands in the foray. Overall 79 brands were launched in last 24 months in Itraconazole. The new launches are valued at Rs.169 crore on MAT basis.